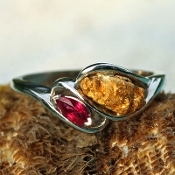 Natural Alaskan gold nugget and Ruby ring in 14kt white gold. This ring can be customized for you by using any different gemstone or with a different metal. Please call us today to discuss how this ring can be customized for you at 907-456-4991.